Microcontrollers such as the Arduino have revolutionized what designers, artists and hobbyists have been able to build. Most microcontrollers, however, don’t do anything out of the box. In order for a novice to get started, they need to learn something about both coding and electronics simultaneously. 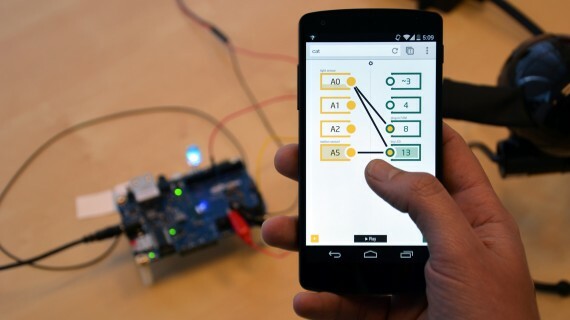 Connect AnyThing is a software program for the Intel Galileo Development Board that essentially beams a simple, visual programming interface from the board directly to any modern phone or tablet. The software allows complete novices to tinker with a Galileo and build creative projects right away. The UI introduces core physical computing concepts while lowering the barriers to entry for new users. The ease of use for novices has led Connect Anything to underpin much of Intel’s educational outreach in 2014/15. Connect AnyThing powered Intel’s main activities at Maker Faire San Mateo and New York, and workshops with Connect AnyThing were developed with Intel Computer Clubhouses, Sparkfun Electronics, Two Bit Circus and the San Jose Tech-Gyrls.